Continued collector demand and higher bullion prices combine to raise your 1891 Morgan silver dollar value to a minimum of $18.63 each. Silver value of these large coins is substantial, but importantly, collectors place additional value on nice well preserved pieces. Also highly prized today are the scarce silver dollars from branch mints with low original mintages. Look for the "CC" mintmark. Your 1891 dollar was minted during the short time span the Carson City mint in Nevada was in production. Being a smaller size operation and striking lesser numbers of silver dollars than other mints, these "CC" mint marked coins are highly prized by collectors. Below the vale chart is a section on identifying and locating mintmarks. High on the list of silver dollar values are coins that have remained in outstanding condition since their minting in 1891. Collectors and dealers inspect the surfaces of coins closely, judging its condition and assign a "Grade." Top grades are "uncirculated" examples. The 1891 Morgan dollar pictured never entered circulation, is free from wear, still lustrous, clearly in uncirculated condition. Follow the grading images and descriptions below and accurately determine you 1891 Morgan silver dollar value. Mintmarks are an important and deciding factor in value. As collectors assemble sets, most include examples from each of the four mints that produced silver dollars this year. Mintmarks are located on the reverse, along the bottom, above the DO in "Dollar". These include an "S" for the San Francisco mint, "O" New Orleans and "CC" Carson City mint. 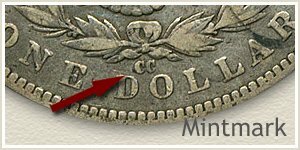 The Philadelphia mint did not place a mintmark on 1891 silver dollars. As the owner of an 1891 Morgan silver dollar, realize its value is in great part determined by condition, especially in the higher "uncirculated" grades. Within this top grade are elite examples with minimum contact marks and abrasions. These amazing unblemished coins often reach values far above average uncirculated examples. 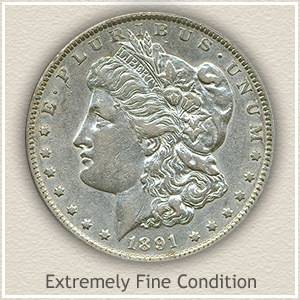 Commanding a high bid of $966 at a David Lawrence Rare Coin Auction the 1891 dollar pictured has all the traits desired to enhance a collection of top quality Morgan silver dollars. Not only are the surfaces free of wear or noticeable marks, this coin is visually stunning with bright luster overlaid with subtle toning. Determining the condition of your silver dollar is essential to finding its highest accurate value. By closely examining the surface and judging the amount of wear reflect its "grade." Entries in the value chart above are listed under these grade headings. 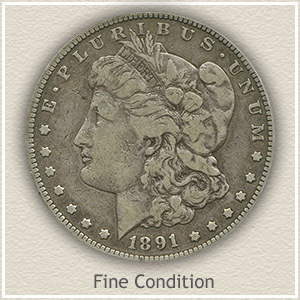 In the case of your 1891 silver dollar, and especially if struck at a branch mint, these many subtle condition details have a significant role in how much your coin is worth. 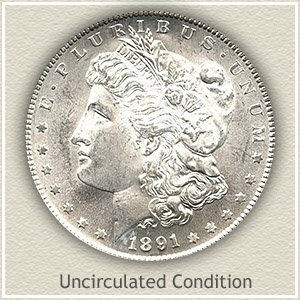 Uncirculated: Is your 1891 Morgan silver dollar value at a premium because of "uncirculated" condition? An uncirculated coin is without any wear to its surfaces. Original silver mint luster still covers all design details. Holding your coin by the edges, and by tilting and slowing rotating, unbroken bands of luster radiate from edge to edge. Any wear disrupts these bands, most evident on Liberty's cheek. Good: Noticeable, heavy wear has reduced the entire design to just a few elements. A silver dollar with extensive wear is designated as "good" condition. Wear has removed most detail leaving Liberty as an outline in low relief. Remaining are a few and now flattened hair curls showing behind her neck and ear. In this condition your 1891 Morgan silver dollar value is tied to bullion silver price. Millions of 1891 dollars were minted, however despite the huge initial number of coins very few are available today in top condition. 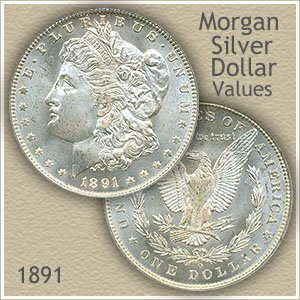 Careful assessment of any uncirculated example is needed to accurately determine the value of your 1891 Morgan silver dollar.